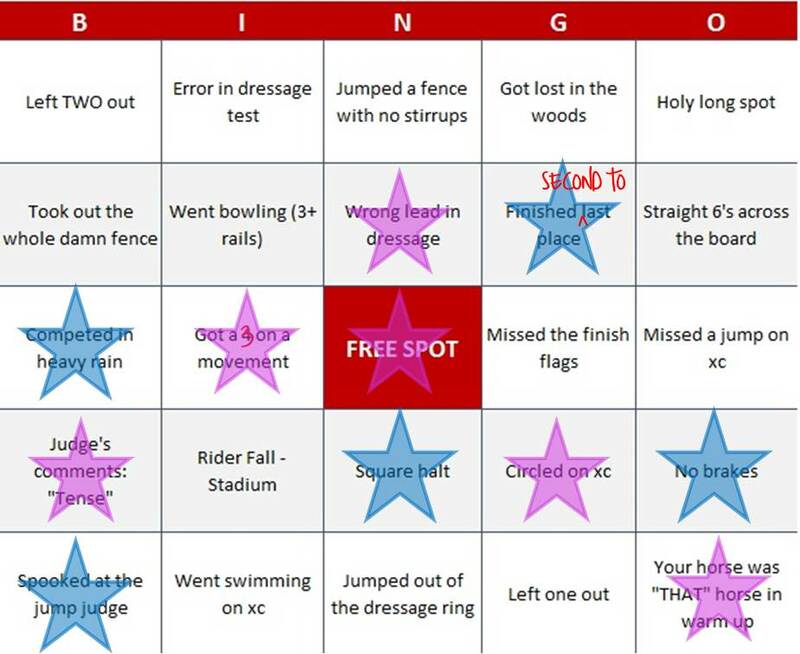 I was pretty amped when Emma suggested Eventing Bingo this year. I knew when I saw my cards that I wasn’t likely to get a full row, but thought I’d take a stab at it anyway. In a perfect world, my bingo cards would have been a little more Murray-centric. But I guess I’ll take what fate gives me. Anyway, I figured with all of the 2017 updates, I’d update my bingo cards as well. And lookie here — with just a teeeensy bit of creative credit-giving, I knocked out quite a few more cells! So sure, we didn’t compete in heavy rain by anyone’s standards… but in June, we had a crazy, aseasonal DELUGE and got nearly 1/4 of an inch overnight before dressage. I feel like doing dressage in the slop is really in the spirit of “heavy rain”, since rain in June in Camelot is basically an apocalypse-level event. I also had no brakes at this event as we approached the trakehner. I knew we needed to slow down and get a look at the fence, but could we slow? Noooope. I somehow managed to finish second to last at two events, and third to last in the third I competed in this year. So I just modified my cards a little to make them more applicable to my status in the bottom 3. At Camelot in August we had a pretty baller square halt. I don’t remember if the judge commented on it (too lazy to go get the test), but here’s the photographic evidence (thanks Kate!). And in August I also fell off of my horse during a warm up day for XC. Camelot schooling shows let you school and warm up on the XC course on the Friday before the event begins, which is where I fell off and sprained my MCL. So I went ahead and gave myself “fell off in warmup” as well. A rousing success it was not. There were a couple of rows there with four items selected, but not the fifth… which is a bummer but OH WELL. I can’t say that I’m sad I didn’t miss the finish flags or fall off in stadium! In the end, I made a few modifications to my bingo card so that it more accurately reflects my season. Murray ain’t leaving any strides out any time soon, so I changed all of those to more accurately reflect his tendencies (deep spots and screaming). And how lucky is it to ride in a division where more than half the riders were eliminated?! Or get toted around stadium and XC on a sprained MCL, coming in a full minute under optimum to boot? Notorious OTTB, that’s who. and look, we got Bingo twice!! Omggggg yes haha!! 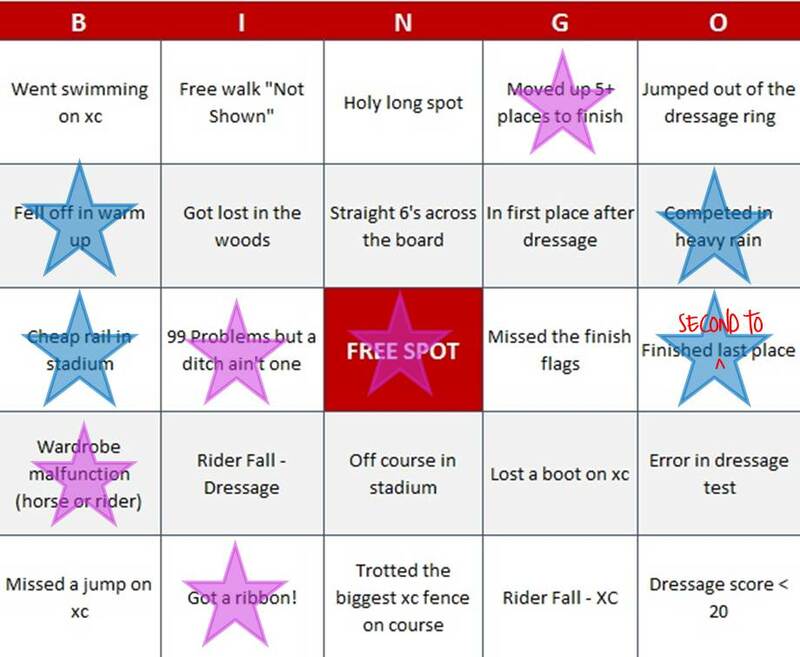 I’m pretty sure leaving “holy deep spot” off the original cards was a glaring oversight – tho all your edits are fantastic haha, truly capturing the spirit of eventing bingo!! Wait- is this a thing for 2018? If so I want to join the fun!! I need to do some similar edits to mine. Sadly, I got very few Bingo spots authentically.